Xishuangbanna is the only piece of oasis on the Tropic of Cancer and the only piece of tropical forest preservation. It is in south of Yunnan Province, with an area of about 20,000 square kilometers. More than 10 ethnic groups inhabit there, such as Dai (傣), Han (汉), Hani (哈尼), Lahu (拉祜), Yi (彝), Brown (布朗), Jino (基诺) and Yao (瑶). Among them, Dai has the largest population. These minorities still preserve their unique culture and lifestyle. People here can see different skirts and the colorful ornaments of the Dai and Brown. You also can see their special houses which are made of bamboo and foods which are served in bamboo tube. Xishuangbanna belongs to tropical rainforest climate, not hot in summer and not cold in winter. So people there feel warm. If you want to travel there, the best time you go is between October and June. The annual average temperature is 21 ° C and it has never snowed there. Even in January, the daytime’s temperatures are high. Festival Closed is one of the important festivals in Dai people. It's often celebrated in the middle of July. At that day, all the old and young must go to some temples to pray. In three months, all the youth can fall in love with each other, but they can’t marry or be out. Festival to Open is celebrated in the middle of October. This festival symbolizes the end of rainy season. From then on, the youth can begin to love freely or hold weddings. That day people will hold a grand banquet. Dai Water-splashing Festival is the most important festival in one year, which begins from 13th to 15th in April lasting three days. In order to celebrating the festival, people usually use their fingers to dip a little water to shed on the Buddha. And then they splash water to others to express their blessings. It’s said that there’s a legacy about Water-splashing Festival. A long time ago, a terrible disaster destroyed the residence of Dai people. In order to help others, seven kind girls in village were determined to fight with the devil. They use the devil’s hair to cut his head. However, the devil’s head was burning when it fell, and the seven girls had to carry the head by turns until it rotted. At last, seven brave girls died. In honor of them, people regarded the day as Water-splashing Festival. 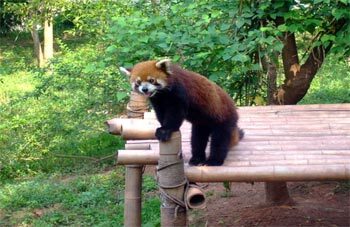 In Xishuangbanna, there are thirteen species of wild life enjoying state protection, including loris, the gibbons, the red-necked cranes, the brown-neck horn-bills, and the green peacocks. This region has 5,000 kinds of plants or about one-sixth of the total in China. Among these are such fascinating ones as the “color-changing flower” whose colors change three times daily and the "dancing herb” whose leaves rotate gently. Then there is “mysterious fruit” which reverse tastes, turning sour to sweet. Species of trees that go back a million years are still propagating themselves. The “King of Tea Trees ," which authorities say is at least 800 years old, continues to sprout, adding extraordinary splendor to the homeland of the famous Pu'er tea. In Xishuangbanna, there is a saying: "Even a single tree can make a forest and an old stalk can blossom and beat fruit.” As a tourist, you must go to visit the mysterious paradise-Xishuangbanna.